Our first class at Shaw Middle school in Washington, D.C. Chef Alli making salad with Michelle Obama. 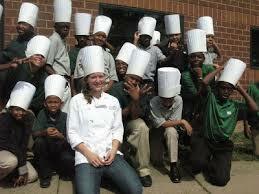 Chef Alli with her first class with DC Central Kitchen. Our First Class in Indianapolis.